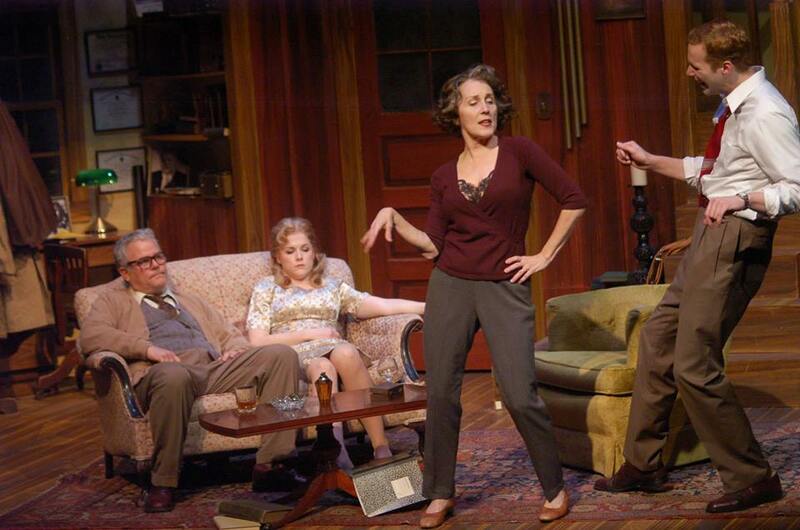 Edward Albee’s classic black comedy (or is it a tragedy? 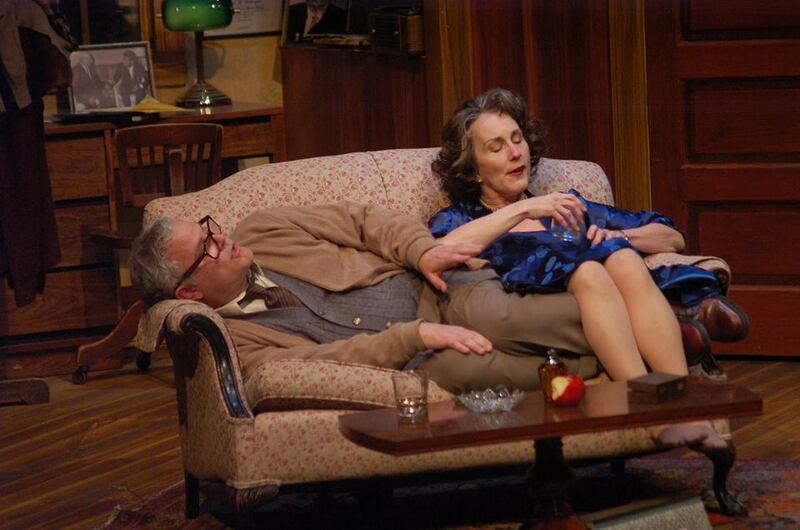 ), “Who’s Afraid Of Virginia Woolf?” sweeps over the stage at St. Louis Actors’s Studio with all the viciousness, biting humor, back-stabbing and, did I mention viciousness? that you’d expect from members of a small Eastern college campus. George, Martha, Honey and Nick spend a night of debauchery, anger and tears as all of their lives are affected from this rite of passage for all four. Martha is the daughter of the college president and she gets George onto the history faculty after their marriage. Things don’t go as well as either planned as George never really lives up to his potential- which means ascending to department head. Nick is the newest faculty member in the biology department and, at the insistence of her father, Martha invites he and his wife to their house after a party that her father has thrown for the faculty. Tension, drinking and George and Martha’s version of “fun and games” ensues and the late evening to early morning deteriorates quickly. As George, Artistic Director of STLAS, William Roth hits every zinger with stinging clarity. His droll delivery gets under Martha’s skin and she retaliates as she so often does, by seducing Nick during the drunken stupor that victimizes them all. He is superb as he volleys and attacks, skewering everyone present. The powerful Kari Ely matches him blow for blow as the unhappy Martha. She can’t resist needling George every chance she gets and then plans and executes her supreme act of revenge and betrayal. These two are volatile together. The stage literally crackles with the sparks that fly between the two and their guests simply get in the way of their nightly war of words and games and are cut to the core as barbs of cruelty slice through the room. Their final, touching scene together brings about that question I had at the beginning- comedy or tragedy, love story or the story of a marriage headed for the rocks? Michael Amoroso is supremely likable as young Nick. As he is slowly sucked into the bizarre ritual with which George and Martha surround he and his wife, he soon comes around to the “rules” of the game himself. 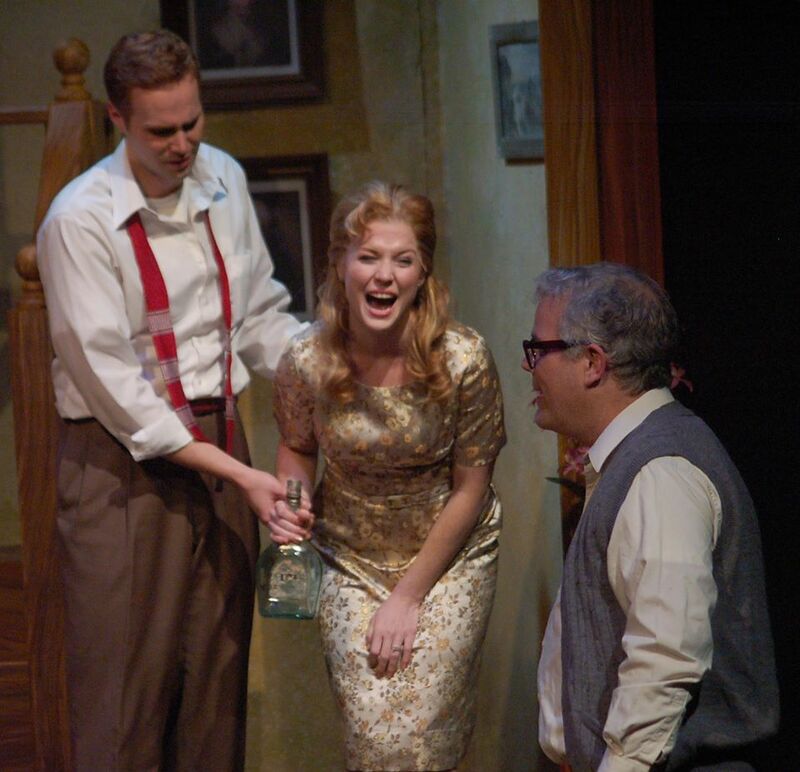 Betsy Bowman returns to St. Louis from her new home in Chicago to tackle the role of Honey. We first see her as the wide-eyed doe that appears to be in awe of both her husband’s new job and the invitation to such a prestigious couple’s home. After getting sick on several brandies, she decides she needs the “hair of the dog” in the form of polishing off the whole bottle and soon turns into a milder, still innocent version of what the other three have become. It’s a tremendous performance from an actress we’ll miss in our town. John Contini directs with a flair for the Albee script. We first see his insertion of the pictures of George and Martha Washington on the set, which is the inspiration for Albee’s main characters (a statement that goes beyond the tongue-in-cheek reference). His quick pace makes the three hour, two intermission play go at seemingly break-neck speed. It’s a weird combination that has you laughing from the gut one minute and gasping in horror the next. It’s all there and Mr. Contini brings it all to the forefront. It’s always amazing how magnificent the sets become on this small STLAS stage. This time around Patrick Huber has brought a realistic look to a comfortably modest interior of George and Martha’s home. 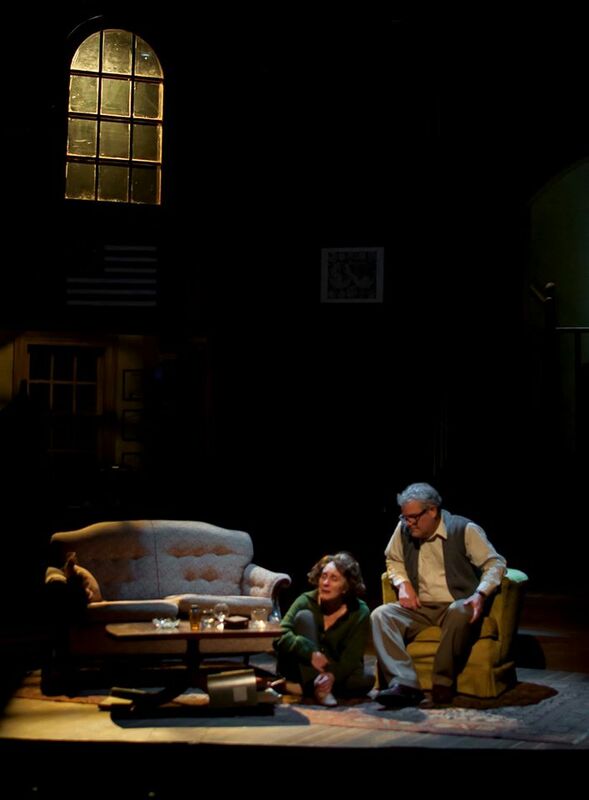 An office in the background that’s rarely used during the play but adds a certain sense of accomplishment to the couple and then there’s the large living room where most of the action takes place and the whole set looks expansive due to angles and height featuring a skylight-like window. Mr. Huber also lights the show to perfection reflecting the many moods of the people and the script. 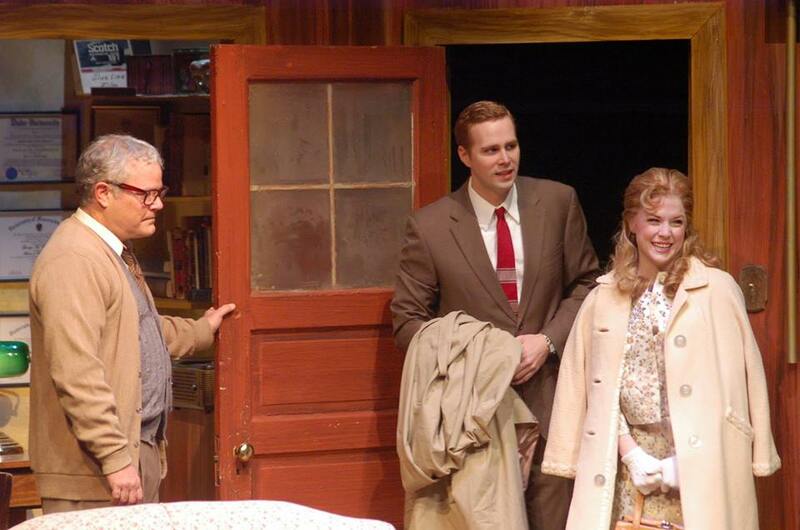 Teresa Doggett has costumed the show impeccably showing contrasts in both couples. This is such a wonderful play and has held up so well since it first burst Edward Albee onto the scene in 1962. If you’ve never seen it, now is the time to get your initiation into one of- if not the best- American play ever written. If you’ve seen it before- I don’t care how many times- this is a production you don’t want to miss. Playing off emotions, the downright cruelty of some of the dialogue is exquisitely contrasted to the biting humor and perfectly planned wordplay. It’s a delight for the eyes and ears as we see things falling apart with enough damage to destroy but then we melt into that last gasp of hope as George and Martha cling to each other in desperation. 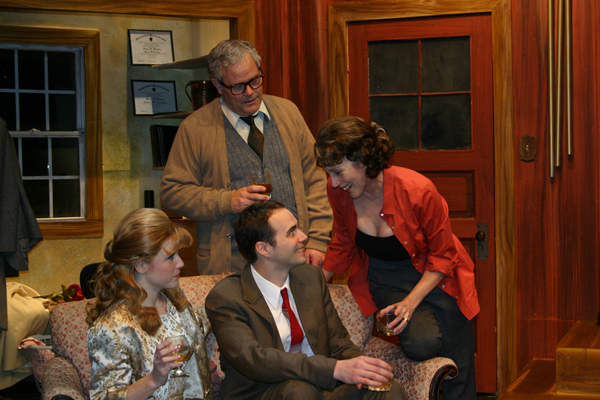 “Who’s Afraid Of Virginia Woolf?” runs through March 1st at St. Louis Actors’ Studio. Give them a call at 314-458-2978 or contact them at stlas.org for tickets or more information. This entry was posted on February 16, 2015 at 9:43 pm02 and is filed under Uncategorized. You can follow any responses to this entry through the RSS 2.0 feed. You can leave a response, or trackback from your own site.